Senior Vice President of BARC, Mark Grover, speaks about the recycling program. 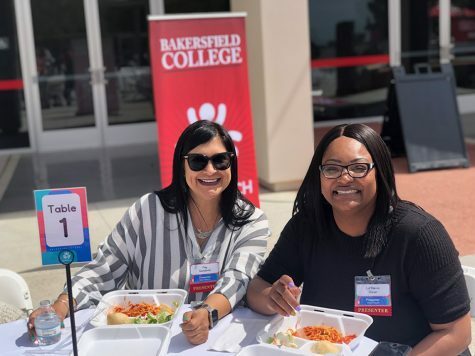 Bakersfield College has taken an initiative in sustainability on campus and has teamed up with local Bakersfield recycling company Bakersfield ARC. 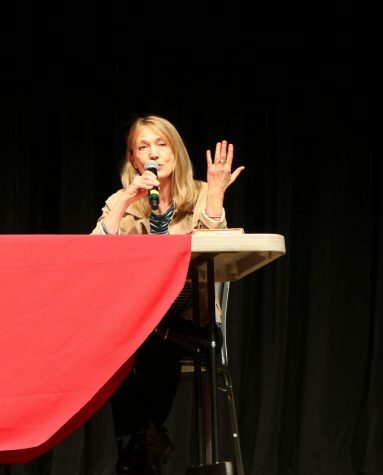 On Jan. 30 at Bakersfield College’s Levan Center, the Sustainability: Building an Institution for the Future Generations symposium was held, where BC’s plans and actions for going green and teaming up with BARC were discussed. 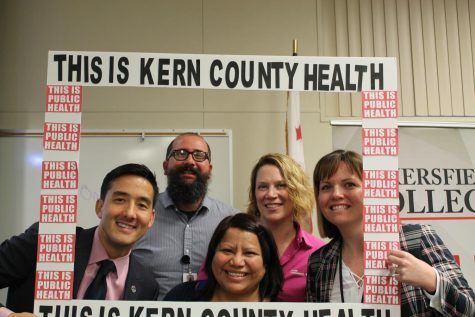 This will be the first sustainability program for Bakersfield College. 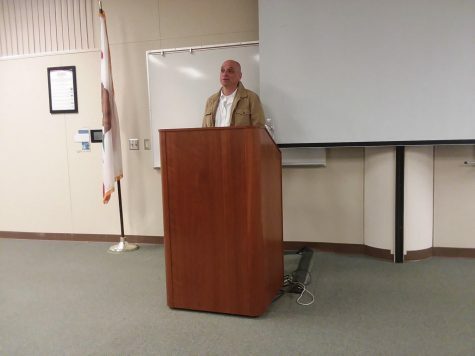 Craig Rouse, manager of Maintenance and Operation, said, “We are behind the 8-ball on what is to be a green campus.” They are working on making the campus more green in order to make Bakersfield College better for the environment and the community. One issue BC is working on, is making its campus a non-smoking zone with designated smoking areas. 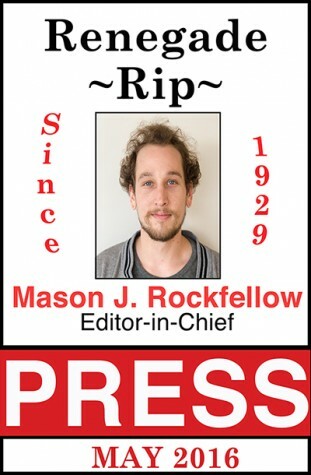 A committee has been formed and they are moving forward with making BC a non-smoking zone. BC plans to get funding and improve the school’s maintenance and infrastructure over the next 30 years. BC has already started making green changes all around the school and has some plans for the near future as well. The solar panels that were installed in the northeast corner parking lot produces about one-third of the energy used by Bakersfield College. These solar panels follow the sun to maximize the amount of energy produced in a day and require minimal maintenance. With help from state grant funding, BC replaced all of the toilets on campus. They replaced all of the toilets with low-flow toilets, a low flow toilet uses about half as much water than a full-flow toilet. By using these toilets BC is saving millions of gallons of water per year. There are now electric trucks around campus lately. Those have replaced the gas-running vans that BC previously used. 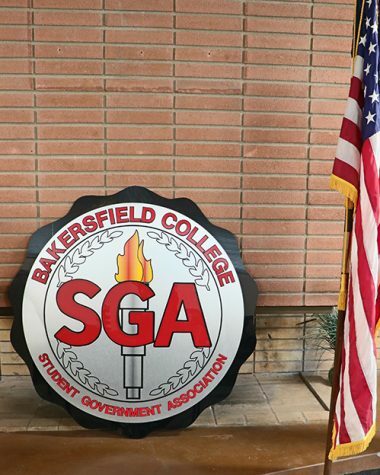 Bakersfield College provided 20 percent of the cost and the remaining 80 percent was covered by the state. With these changes taking place, Bakersfield Campus wants to try to have all gas vehicles replaced by electric vehicles by 2016. BC has also replaced some of the lights on campus with LED lights and hopes to have all lights on campus replaced by June of 2015. Soon BC hopes to qualify for a grant to replace the current sprinklers and sprinkler system. New sprinklers and sprinkler system could save 20 to 30 percent of water a year. Part of Bakersfield College’s efforts of going green, BC has teamed up with BARC and have started a new recycling program. 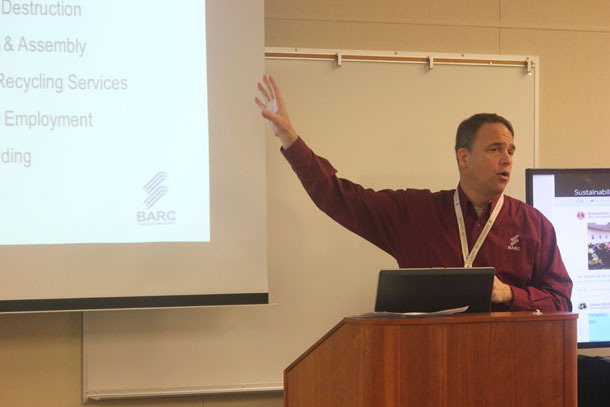 Mike Grover, senior vice president of BARC, talked about BARC’s role as a business and as a service of the community, as well as their role at BC. BARC works with four types of people with disabilities, people with epilepsy, cerebral palsy, autism, and intellectual disabilities. BARC gets their funding three ways. They get funding through donations, state funding, and through the services and programs they provide competing in an open market. “Every dollar we get goes back into the programs,” said Grover. The programs that BARC run help people with one of four disabilities learn how to work and it helps them get jobs. “We provide the opportunities but they get to choose what they want to do,” said Grover. Phase one of BC and BARC’s sustainability plan has already started. If you haven’t noticed yet, they have put up blue recycling bins accepting co-mingled recycling around campus, anything recyclable with the numbers one through seven on it can go in the bins, this number will be inside of a triangle made of arrows usually located at the bottom of the recyclable, this number is called the resin number. The resin number identifies what types of recyclable materials it’s made of. “Sustainability is about planting seeds…and making sure the next generation gets to use BC just like us,” said Grover.